The forex reserves were $405.14 billion as on July 20, a decline of $19.40 billion from the March 30 figure of 424.36 billion, and $20.94 billion from the highest value of $426.08 billion (April 13). The forex reserves had crossed the 0-billion mark for the first time in September 2017. India’s foreign exchange reserves have been falling steadily over the last many weeks, possibly due to intervention by the Reserve Bank of India to stem the rupee’s slide and also because of capital outflows from the debt market. 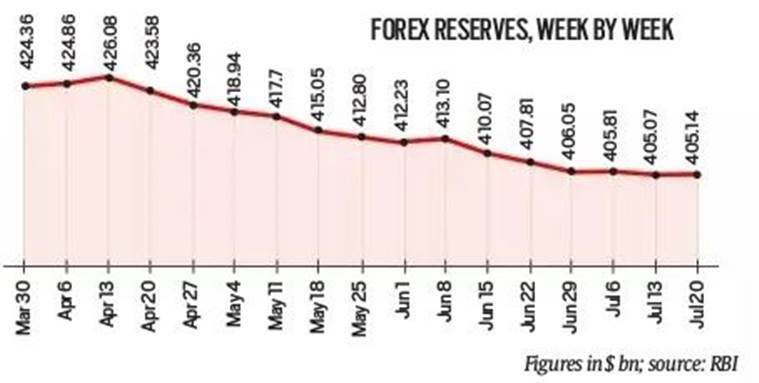 The forex reserves were $405.14 billion as on July 20, a decline of $19.40 billion from the March 30 figure of 424.36 billion, and $20.94 billion from the highest value of $426.08 billion (April 13). The forex reserves had crossed the $400-billion mark for the first time in September 2017. Foreign exchange reserves provide a cover for imports and enable the central bank to intervene in case of high volatility in currency markets. Experts, however, say a decline is not a cause of worry. “India has adequate reserves to meet its liabilities and so there is no cause of worry. Also, I feel that the decline is on account of RBI’s intervention in the forex market to control volatility and that is a prudent measure,” said D K Joshi, chief economist at Crisil. A recent Crisil report notes that India’s short-term external debt as a percentage of total external debt has remained broadly stable over the past few years (20.5% in FY14 to 19.3% in FY18) and the stability has been accompanied by India’s improving ability to service short-term debt obligations. Assam’s updated National Register of Citizens, which has listed 2.89 crore citizens, has left out 40 lakh others who could not prove their citizenship. How did the 2.89 crore prove that they were citizens? NRC officials verified two kinds of evidence — “legacy data”, or any one of 12 admissible documents. “Legacy data” is a collective term for a set of “legacy documents”, comprising Assam’s 1951 NRC and electoral rolls up to 1971. Anyone named in any of these legacy documents, as well as their descendants, were eligible for the updated NRC. Legacy data were available in photocopies (area-specific) at NRC Seva Kendras, which also had digitised legacy data (all-Assam). For every entry in these documents, a unique 11-digit “legacy data code” was generated; every applicant had to submit either her own legacy data code, or that of an ancestor. For those who could not link their ancestry to these legacy records, the option was to submit any one of 12 documents — land/tenancy records; citizenship certificate; permanent residential certificate; refugee registration certificate; passport; LIC policy; govt licence/certificate; govt service certificate; bank/post office accounts; birth certificate; board/university educational certificate; court records — provided that the document was dated before the 1971 cutoff. Tip for Reading List – Should you believe celebs on health? Deeply immersed in their work and not always adept in public communication, scientists often fail to package their insights for the lay public to understand or appreciate. This opens up space for visible or articulate celebrities, politicians and activists, who flood the media with information about health that can be misleading or incorrect. 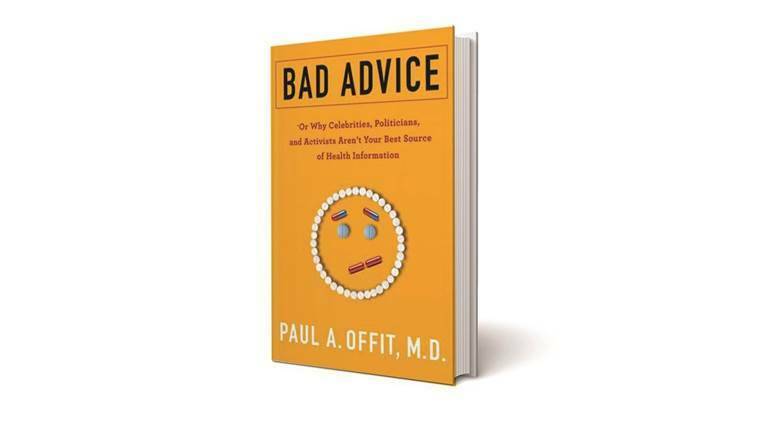 Paul A Offit, an American professor in paediatrics and vaccinology, addresses the need for scientists to battle such misinformation in Bad Advice: Or Why Celebrities, Politicians, and Activists Aren’t Your Best Source of Health Information. He discusses science and its adversaries, including groups promoting pesudoscience, and calls on scientists to “become an army of science advocates”. “While Bad Advice is a quick read, its goal is weighty: to defend science as a vital beacon in the public sphere,” The Washington Post writes in its review of the book.